Want To Know The Best Cone Drills For Speed Training? Speed, agility, and quickness are all vital attributes of a pro athlete. To put it simply… Slow athletes get left behind. Don’t let this be you. Use cone drills for speed training, to increase your strength, and to maximize your performance. Speed cone drills are designed to work all your leg and core muscles, as well as the tendons in your body. This speed training cone drill develops foot co-ordination and speed. First, place a series of cones in a straight line. The first 10 cones should be about 1 meter/yard apart. The next 10 should be 2 meters/yards apart. From standing start, sprint the entire length of the cones taking one step between each marker. Having the cones closer together will encourage faster, shorter strides. You can gradually shorten the distance between the cones as you progress. Walk slowly back to the start to recover. The shuttle drill forces you to accelerate, stop and change directions quickly. Set three cones 5-yards apart from each other in a line. Begin at the center cone. Sprint towards the cone on your right. Touch it, then change directions and sprint 10 yards to the cone on the left. Touch that cone and then sprint back to the middle cone where you started. After a 60-second rest and do the drill again, but this time start out by sprinting to the left cone. This drill is often used to improve agility performance. To set up you should place three cones 1,2,3 in a straight line, spaced approximately 5 yards (5 m) apart. Begin facing cone 2, with the hips, torso and shoulders parallel to the cones. When ready, turn and sprint left to cone 1, turn 180 degrees and sprint back to cone 3, make another 180-degree turn, then sprint back past the middle cone. This drill helps with multidirectional sprinting speed. Make a large “T” shape with the cones. The horizontal and vertical axis should be 10 yards in length. Stand at the bottom of the vertical axis. On go, sprint forward and touch the first cone. Sidestep to your left and touch the left cone. Sidestep to your right and touch the right cone. Sidestep to your left to return to the center cone. After touching it, run backward to your starting position. Rest for a few minutes then repeat. 5. The 5-Cone Agility Drill. Set four cones up in the form of a diamond about and set the fifth cone in the middle. Set the outer cones 10 feet from the center. Start at the middle cone with your left hand on it. Run to the right cone and touch it with your right hand. Run back to the center and touch it. Repeat this pattern with each cone at the bottom-to the left, and the top, in that order-until you touch the top cone. 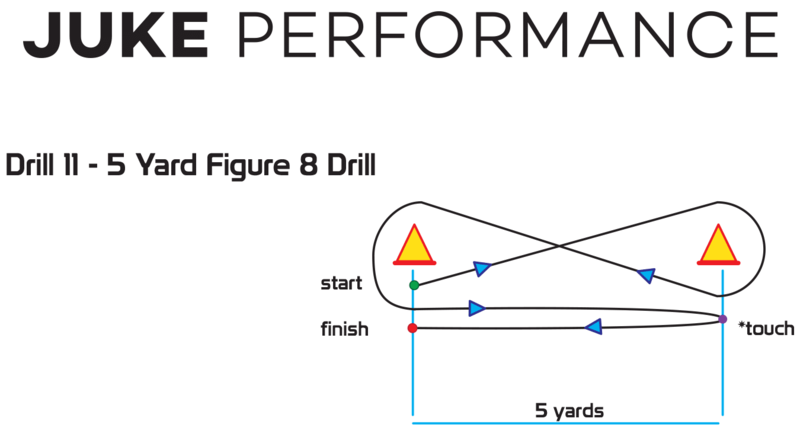 This drill is great for improving speed in confined spaces. Set four cones to create a square with sides approximately 6 – 10 feet (2 – 3 m) long. The cones are numbered one through four. Start at the center of the box and then run, backpedal or shuffle to touch one of the 4 cones. Sprint back to the starting position. Repeat this drill for approximately 10 seconds per set and do two or three sets. The good thing with these cone drills is that you don’t need fancy equipment to help you improve as an athlete. All you need is your body, space and cones. 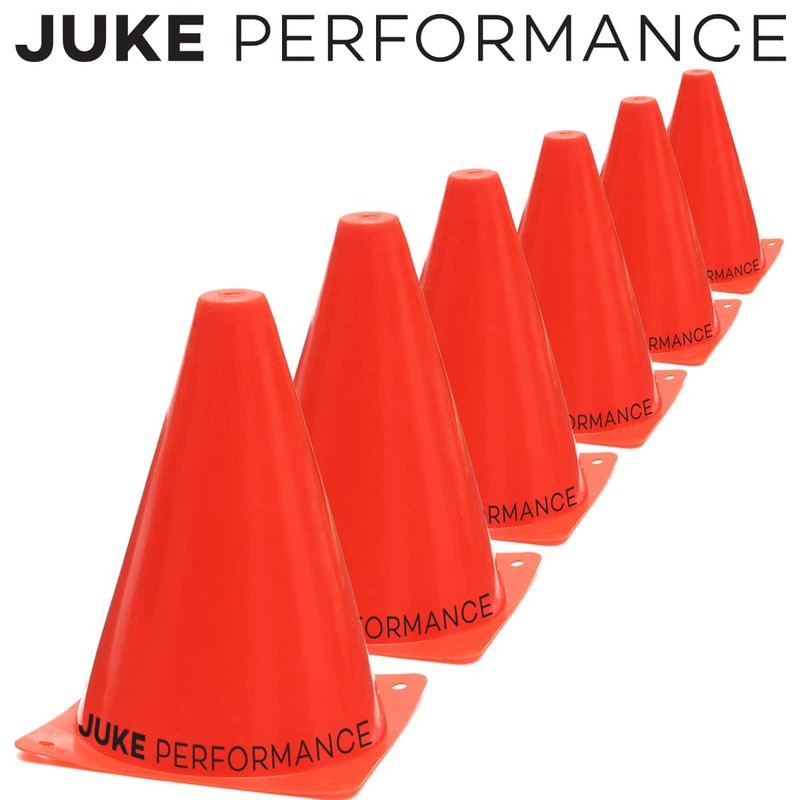 That being said, you can attain greater speed, strength, power, stamina in the cone drills using the Juke Performance MASS Suit. 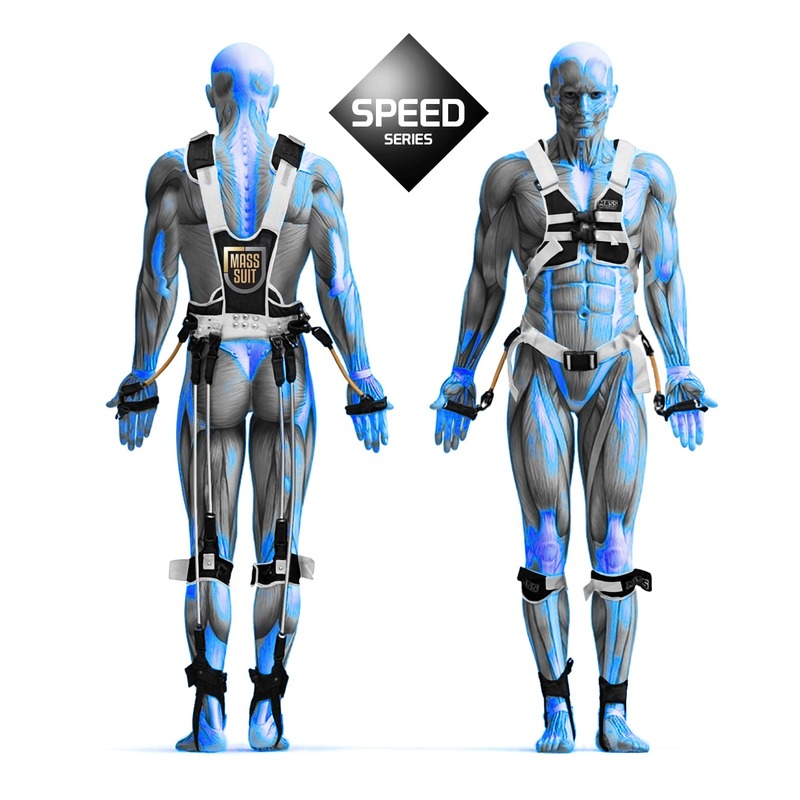 The Mass Suit uses a unique patented design to provide resistance training to your entire body with its rubber resistance bands. The resistance bands are positioned in crisscrossed angles that will force you to work against your body’s natural movements. They increase resistance to muscles that control and strengthen your core. With these bands, you can create an intense workout designed to improve your speed, balance, strength, power, muscle stamina, cardio stamina, and stimulate fast twitch muscles. The different colors of the bands indicate the type of resistance. Yellow is light resistance, Silver is medium resistance and Gold is heavy resistance. You can purchase resistance bands of different thicknesses/lengths to provide various amounts of intensity. The MASS Suit resistance bands can also be removed for removed or switched for different workouts. Quads, hip flexors and hamstrings are stimulated by resistance created by the MASS Suit during the cone drill. You need your foot to hit the ground as fast as you can and lift your leg as fast as you can to generate high speeds. Eventually, you will see an improvement in your sprinting speed. 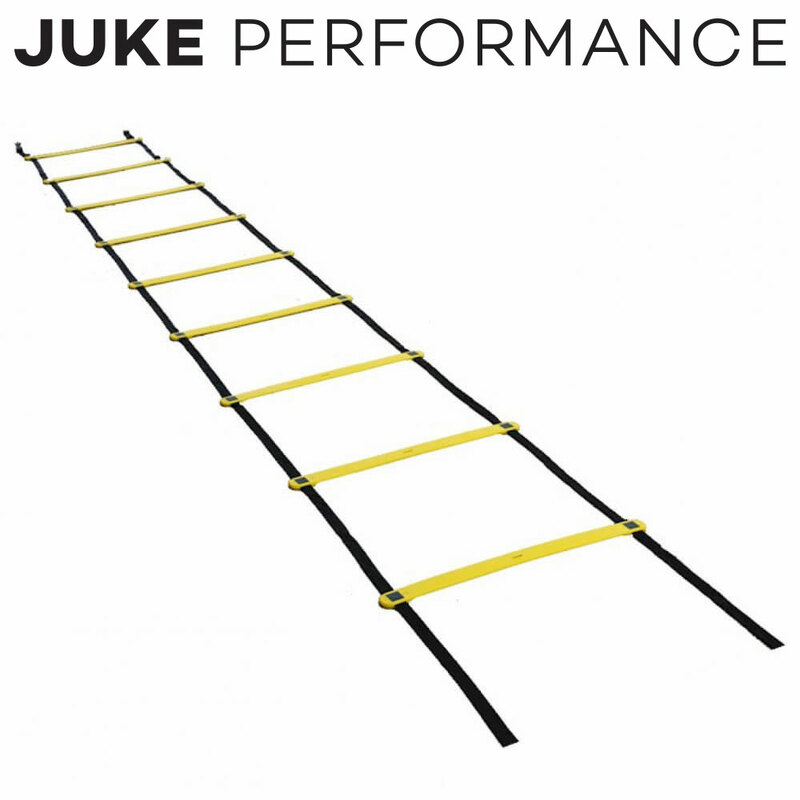 Whether or not you use the Juke Performance MASS Suit in the cone drills, it is advised that you train at a high intensity level to increase your performance. Cone drills build speed on their own, but it is your intensity and rep scheme that will change the workload.